The Melissa and Doug Latches Board is a great educational and fun toddler toy - read my review and get the best price now! If you are looking for a fun and educational toy to give to your toddler this Christmas, you won’t go wrong with a Melissa and Doug latches board. What is the Melissa and Doug Latches Board? It doesn’t sound like a very exciting toy but as far as I’m concerned, this latches puzzle is a work of genius. If you have a toddler, you probably have experience with them opening cupboards they’re not supposed to, working out supposed ‘child-proof’ locks and taking things apart. Frustrating for parents, yes, but this is all part of being a toddler and small children love working out the mechanisms of different latches and opening and closing mechanisms. This is also very important for early brain development and helps to improve fine motor skills. 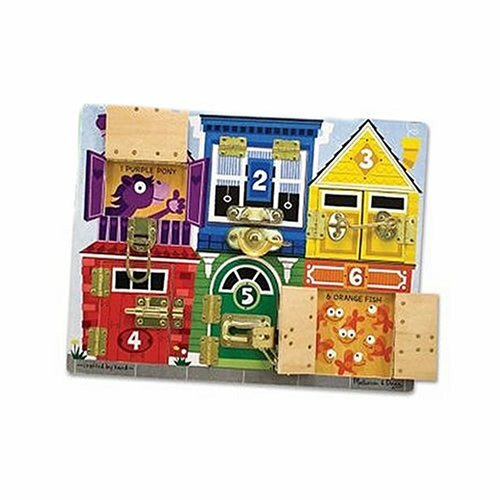 The latches board by Melissa & Doug allows your little Houdini to practice their lock-picking skills on a safe and fun toy that also includes lots of other opportunities for learning. At first glance, the board looks similar to a wooden jigsaw puzzle. It measures 15.8 inches by 11.6 inches and is a nice chunky 0.4 inches thick. On the surface of the board are 6 numbered doors, each secured with a different type of latch, clasp or lock – all high quality and made from brass. On unfastening the latch and opening the board, a different animal is revealed behind each door. You can think of the Melissa and Doug latches puzzle as being like a super advanced ‘lift the flaps’ book. As well as the excitement of opening the doors to see what’s inside, the child has the additional learning experience of figuring out how to open the latch. Most toddlers will start by being able to unfasten one or two of the latches and gradually work out the rest over time. This makes it a great toy to keep your little one occupied for long stretches of time – maybe on a long car or plane journey. naming animals and counting them. Are There Any Downsides to the Melissa and Doug Latches Board? Some parents have expressed concern that teaching children how to open different kinds of locks and latches could be dangerous as they will then have access to previously secured cupboards and containers. Personally, I do not think this is an issue as the type of latches used in the board are not so secure that you would use them to hide away dangerous things. If you have latches like this on cupboards within reach of your toddler, they are going to work out how to open them anyway. The board is also quite heavy at 1.1 pounds, so if your child is the type to throw things you will need to supervise carefully as they play with this toy. However the weight also means it is durable and I prefer to give my daughter good quality toys and teach her to look after them properly than give cheap plastic toys. What age is the Melissa & Doug Latches Board Suitable For? This toy has a recommended age range of 36 months – 6 years. I personally think it is perfect for my 13 month old daughter and, as with any toy, if used with supervision would be suitable for younger children. I do feel that this is a better toy for young toddlers and that children of 5 or 6 would probably get bored with the toy a lot more quickly as it would be too easy for them to figure out the latches. It would also make a great sensory toy for older children or adults with learning difficulties or vision impairments. 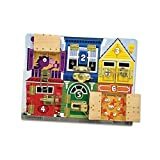 How much does the Melissa and Doug Latches Puzzle Cost? The recommended retail price of the Melissa and Doug Latches Board is $24.99 but you can save 22% and get free shipping (with additional purchase) by buying from Amazon at the link below.